"Intelligent movies are very difficult to make." How does it feel? Like a Rolling Stone, that's how. This behind-the-scenes look at Mick Jagger doesn't blow the lid off of anything, but does provide some languorous glimpses at the effects of decades of fame. You won't come away knowing just what it's like being Mick, but this is at least a taste of his world, circa 2001. 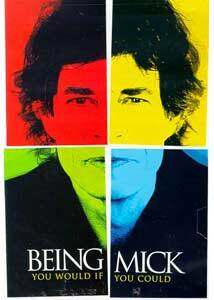 Mick goes to London, to Miami, to Cologne, to New York, Paris, back to London, and of course any self-respecting aging rock star does not travel without his own personal documentary crew. What's striking about Jagger's life initially is the ordinariness of what for most of us would be extraordinary intrusions. But Jagger will be sixty next year, and he's been among the world's most famous people for almost forty of those years, so it's all part of the drill, these constant interruptions by strangers who feel as if they know you and paparazzi looking to capture your every move. Some of us spend our days stuck in traffic or doing too much homework, some of us spend them fighting with the boss or looking after the kids, and some of us have the chauffeur take us to Sir Elton's for a benefit where we're smothered in an embrace from Kate Winslet. He seems reasonably serious about wearing the film producer's hat, but doesn't seem as if he's especially hands on. (We get a brief glimpse at his producing partner, who, I'd wager, does most of the heavy lifting.) There's a certain mutual exploitation in many of these exchanges—Jagger gets new legitimacy as a producer, as an art collector, as a cricket commentator, and everybody he encounters gets to rub elbows with a Rolling Stone. Decades of this living has given him a thick skin, and while he's well mannered, he seems to have nothing but thinly veiled contempt for Winslet when she blows off the Enigma premiere, "for personal reasons." For Jagger it seems like time to make the doughnuts, and he puts on his best game face, chatting up the crowd, working the reception line, making insipid small talk with Prince Charles. It's more Jagger the operator, the canny businessman, who is on display here, and he's ready and willing to commodify himself for public consumption. What he knows that Winslet doesn't is that it's part of the job description. I suppose we're supposed to be struck with the ordinariness of Jagger's life, and we are, for the first minutes. But after a while, it's just the boring details of living, and you don't really want to watch anyone's, even if they're Mick Jagger's. Mick brushes his teeth. Mick does the crossword. Mick talks on the cell phone. Mick puts dressing on his salad. Mick rides the stationary bicycle. He is good company, at least, and gets high marks for being a devoted father to his many children. (We also meet Mick's brother and their father, both of whom seem absolutely baffled by the circus surrounding Mick.) Also, I can't imagine that there are too many other rock musicians who could casually toss off Shakespearean references while they're sitting in the makeup chair. The documentary ends with the launch party in L.A. for the new album, with Jagger taking the stage to perform the first single. For all the nonsense that's preceded this, and even though it's not an especially terrific song, it's great to see him up there, as he remains a charismatic and mesmerizing performer. These final minutes are the most riveting on the disc, and you'll probably come away not wanting to be Mick, but to see and hear him on stage, at least. Image Transfer Review: Much of the documentary footage was shot with handheld camcorders, and so things can be a little shaky, but the transfer to DVD is a respectable one. Resolution is weak�surely due to the source material�but color and black levels are adequate, and interference is at a minimum. Audio Transfer Review: As with the image quality, the limits of the original material puts a cap on the audio capacity, but there's very little buzz and hiss, and the dynamics are fairly stable. Extras Review: The first accompanying documentary, Goddess in the Doorway (18m:02s), is a promotional package for Jagger's album of the same name—it features him performing three songs at the album launch party (one of which is included in the feature), intercut with interview footage of him discussing his collaborators on the project. The second, Home Movies (17m:01s), is just what it says it is, and isn't markedly different from the feature—now it's Mick in Venice, Mick acting in The Man from Elysian Fields with Andy Garcia, Mick promoting Enigma at the Sundance Film Festival. The featurette, Don't Call Me Up (01m:29s), seems like a fragment of a music video; there are two complete music videos from the solo album here, the first of which, God Gave Me Everything, is full frame, while the second, Visions of Paradise, is letterboxed. The tag line on the DVD cover is "You would if you could," but I don't know about that, and Jagger is such a cagey character that it is, perversely, almost more fun to see the public Mick than the private one. I'd recommend dropping Hot Rocks into the CD player, or checking out Gimme Shelter before this disc, but if you're hot to see what it's like on the other side of the velvet rope, here you go.